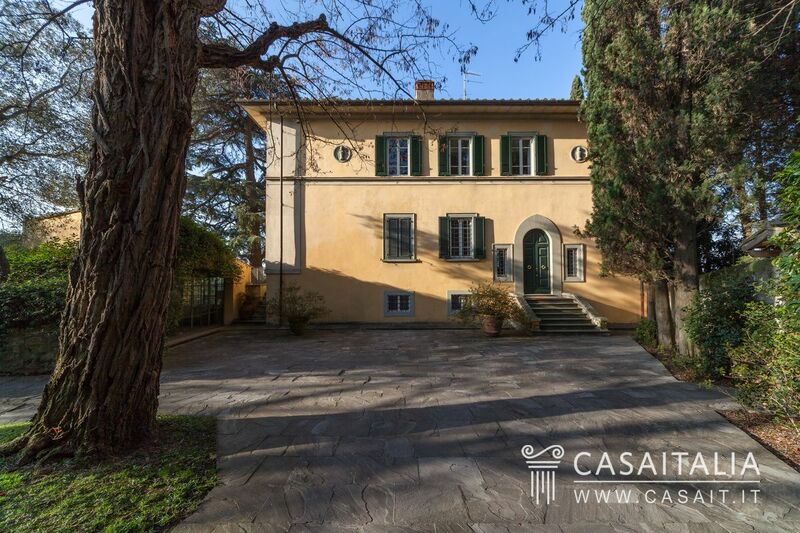 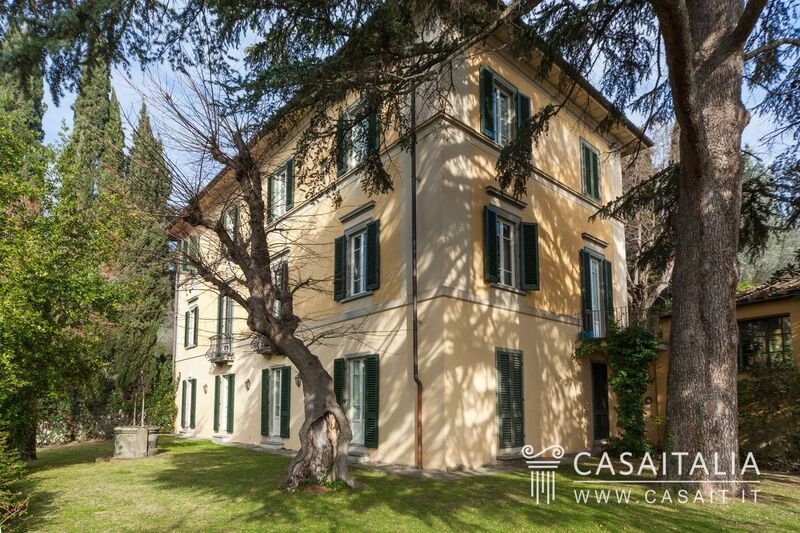 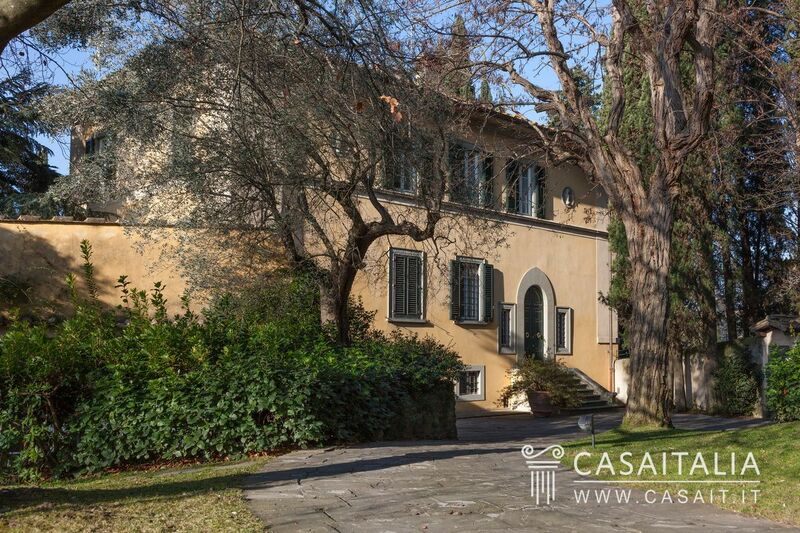 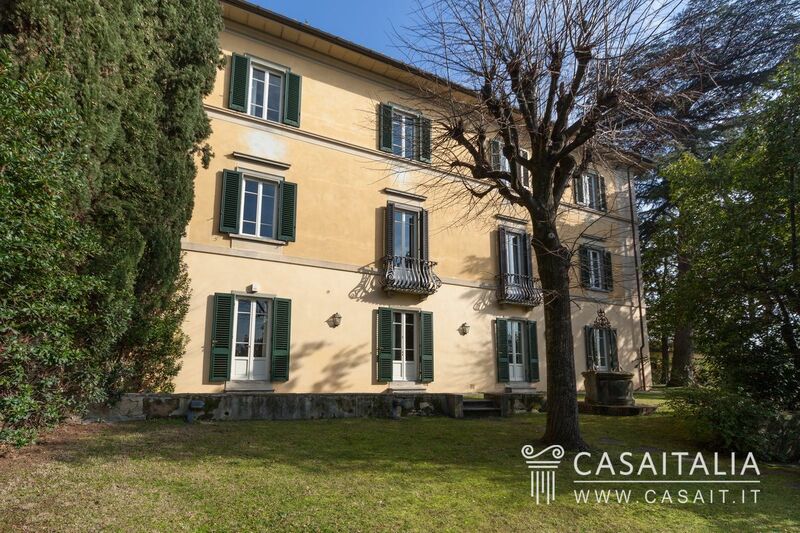 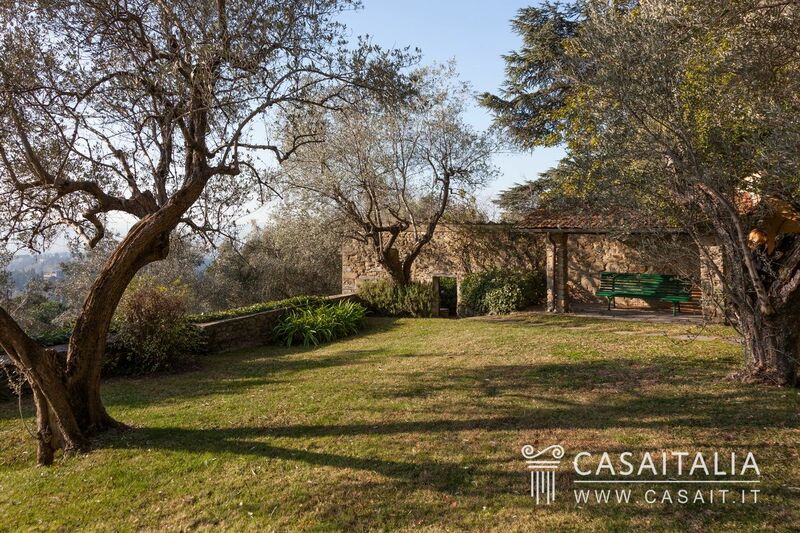 Period villa in the hills, 500 metres from the centre of Fiesole and 2 km from Florence, with around 8,500 sq.m of private grounds with olive grove, many extra spaces and a convenient parking area. 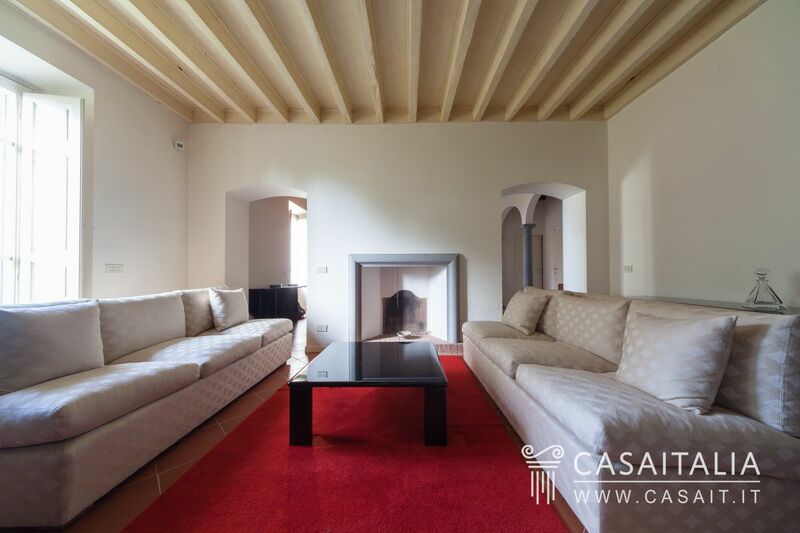 Villa measures around 700 sq.m in total, with various living spaces, 6 bedrooms and 9 bathrooms. 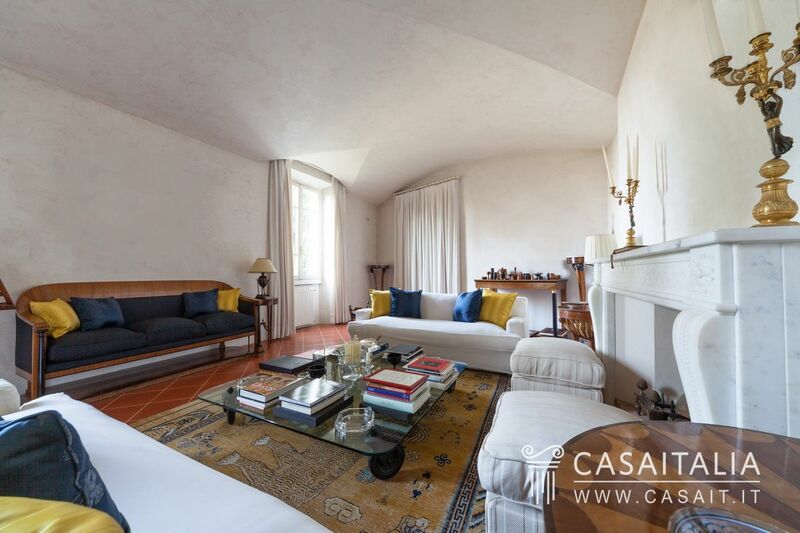 Separate apartment for guests. 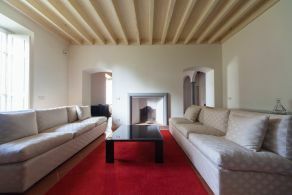 Total surface area of extra spaces is around 175 sq.m. 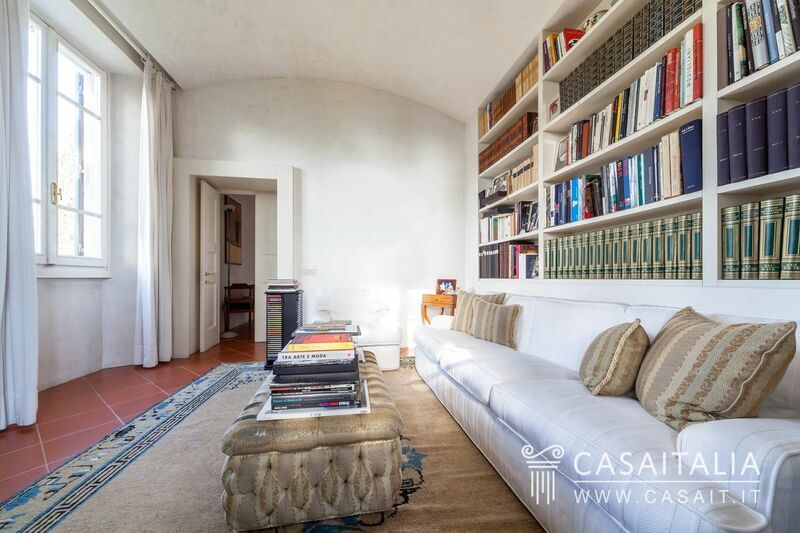 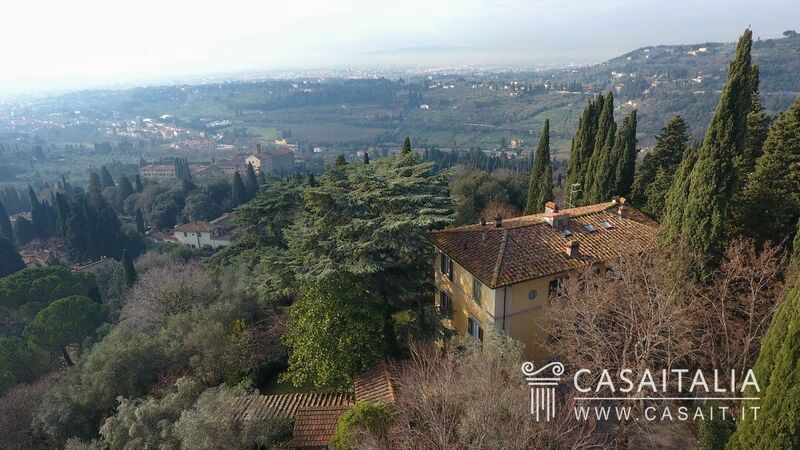 Villa Florentia is situated in Fiesole, a picturesque town perched on a hill just above Florence, only 2 km away. 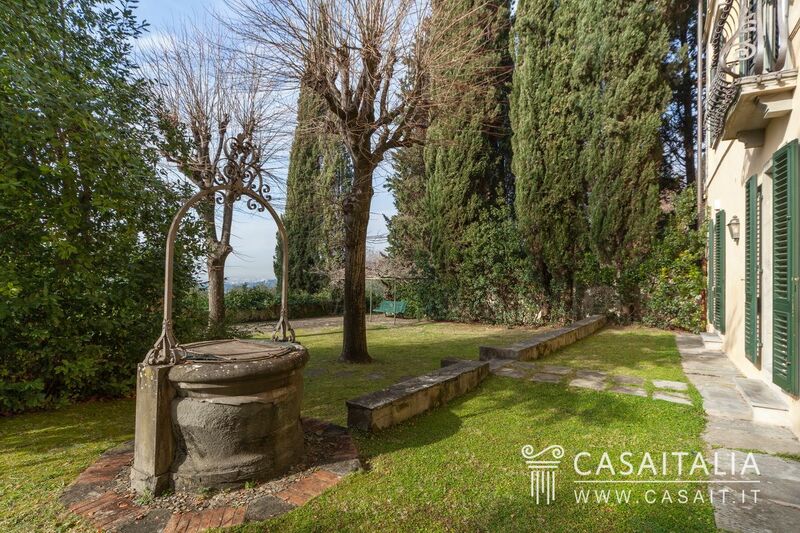 The location is hilly and panoramic, from which you can admire the view of Florence and see the unique dome of its Cathedral. 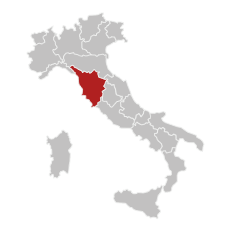 The motorway connection is 9 km away and allows you to reach Lucca (75 km) in around an hour and Bologna (95 km), Siena (80 km), Pisa (93 km) and Viareggio (105 km) in under an hour and a half. 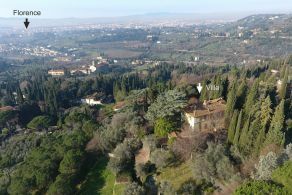 The closest airport is Florence Amerigo Vespucci, 10 km away. 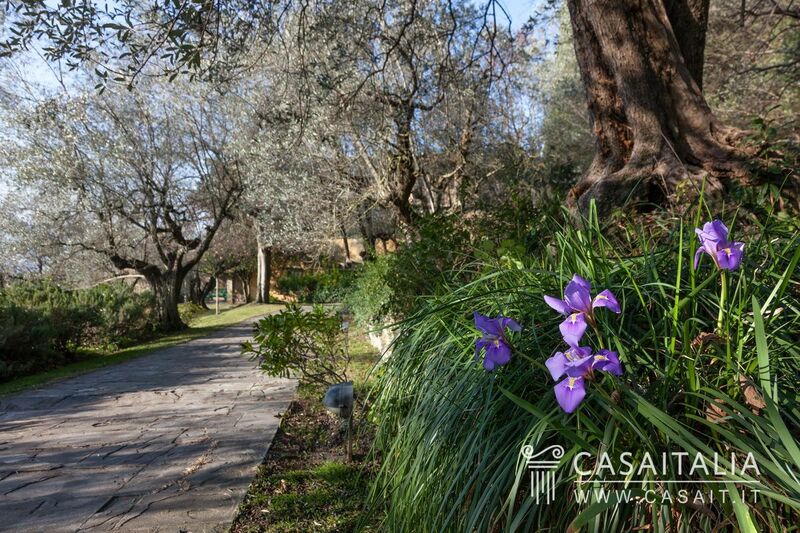 Surrounded by pretty, shady grounds with an olive grove with around 100 trees, the property comprises a large period villa measuring around 700 sq.m in total, divided into the main residence and a separate apartment, and various extra buildings with a further combined surface area of 175 sq.m in total. 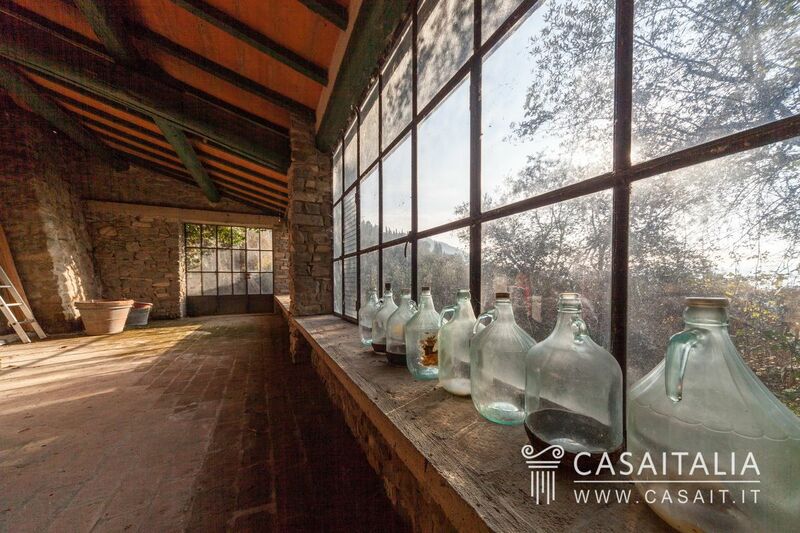 The structure of the villa follows the incline of the land and has four floors, plus a basement area used as a cellar. 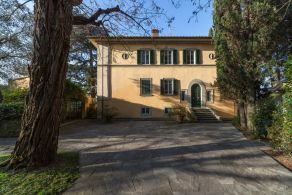 It is currently divided into the main residence and a separate apartment, however, thanks to an internal staircase connecting the two, it could easily be converted back into one house. 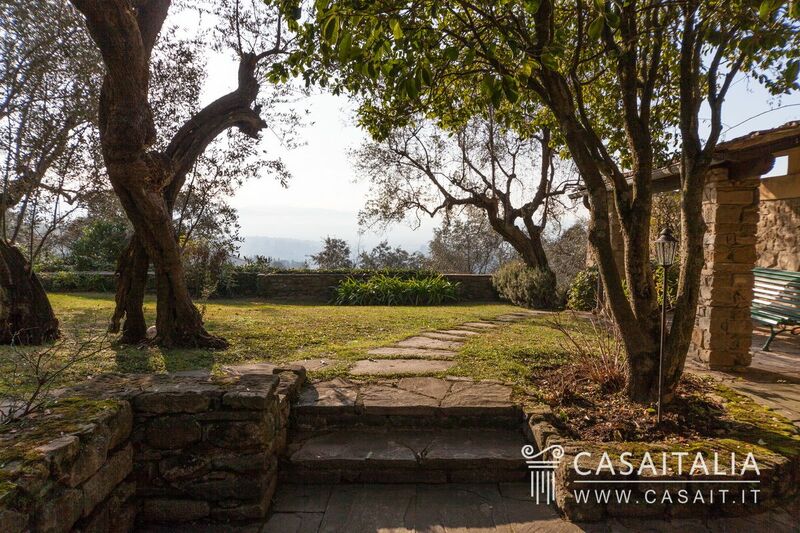 The main entrance to the property leads to the hallway of the main residence, which is on the raised ground floor. On this floor, the large living space is divided into a kitchen with two pantries, an informal dining room, dining room, living room, study/TV room and a bathroom. 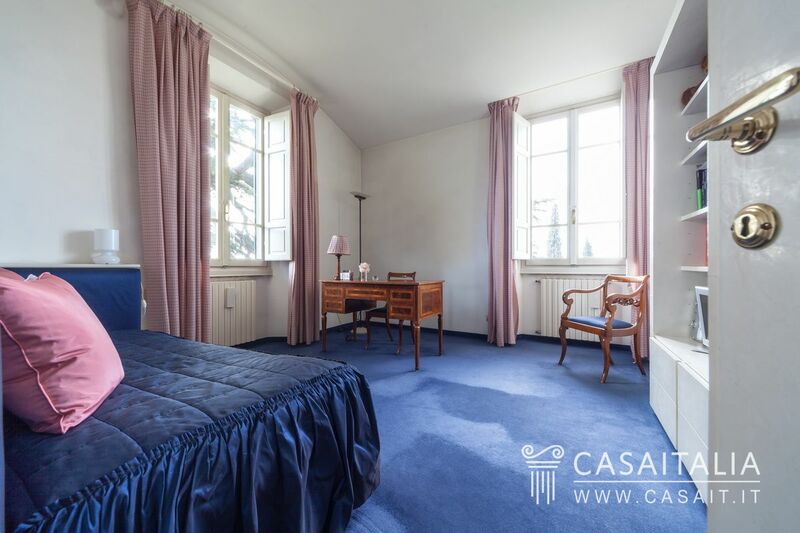 On the floor above, there are the sleeping quarters with master bedroom, with walk-in-wardrobe and en-suite bathroom, three further bedrooms also with wardrobe and private bathroom, and an area currently being used as an ironing room but which could also be used as a study or an extra bedroom. 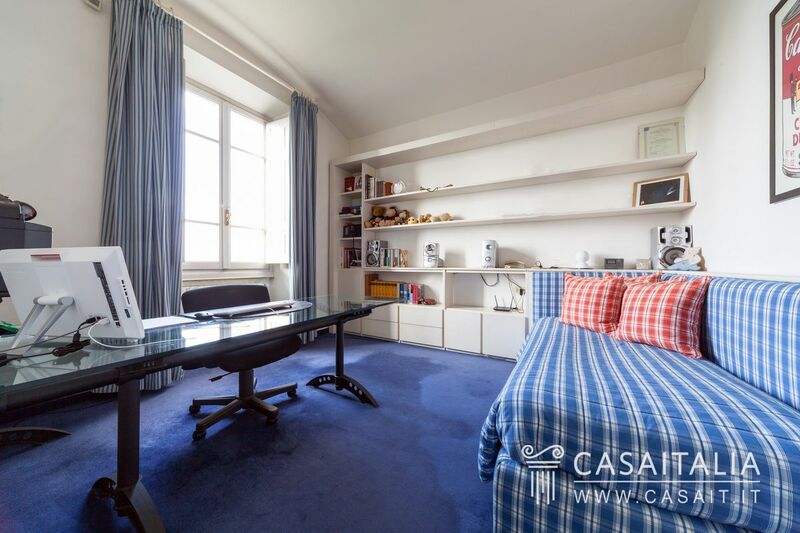 Further upstairs, there is the attic floor with mezzanine, the wardrobe space, a store cupboard and an area which could be turned into a bathroom. 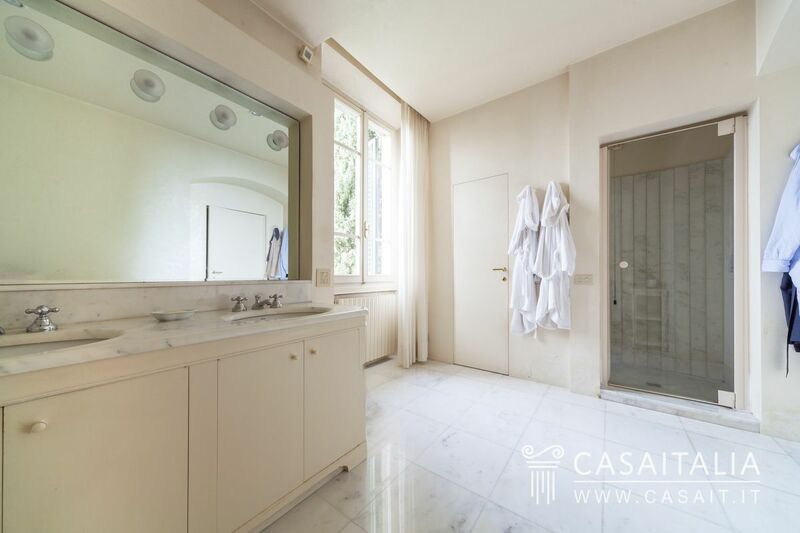 On the ground floor there is a laundry room, dressing room (or guest bedroom), and bathroom, and two large cellars on the basement floor. 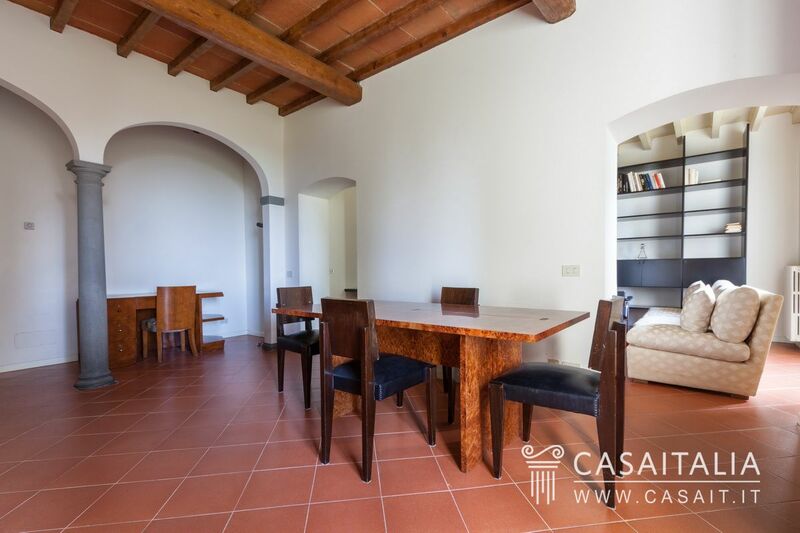 The property has a second driveway which leads to the entrance to the guest apartment, which is all on the ground floor of the villa and is divided into a living room, sitting room with fireplace, kitchen, two bedrooms with dressing room and private bathroom, two store cupboards and another bathroom. The apartment used to be part of the main house, and the original internal connection could be restored if desired. 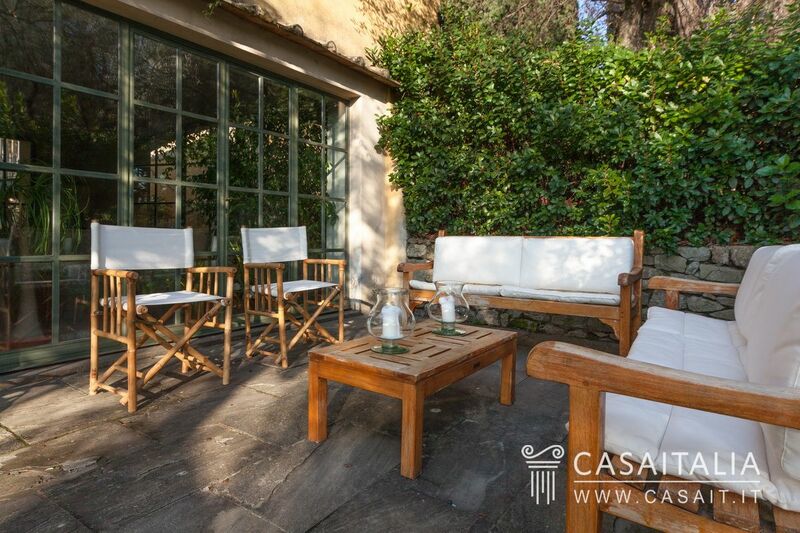 Next to the main house, in its own building measuring around 50 sq.m, there is the conservatory: a pretty space with large windows where, even in colder weather, you can spend a few pleasant hours enjoying the light and the greenery of the grounds. 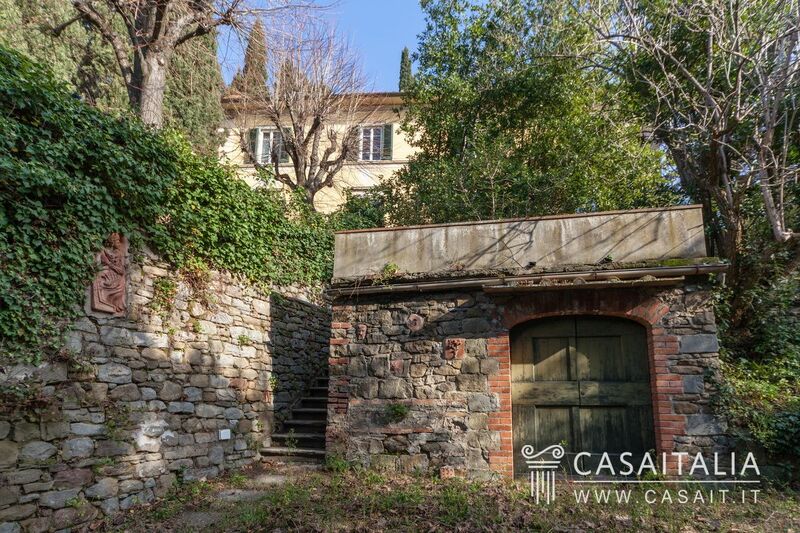 - The cellar, measuring 37 sq.m in total. 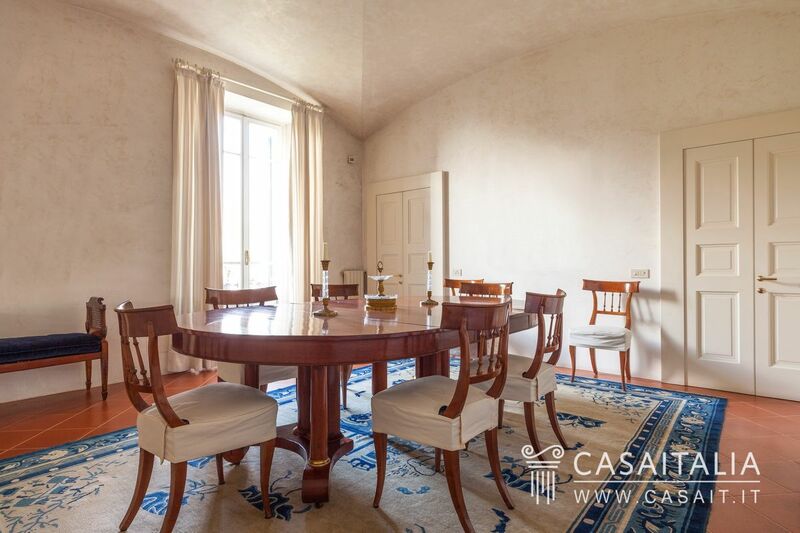 The house has been completely restored, with high quality finishings, and is in excellent condition. 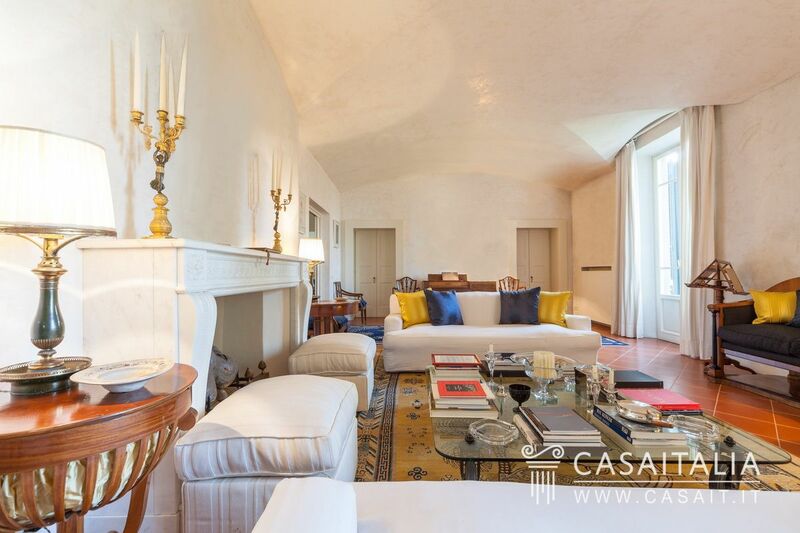 Inside it is simple and modern, perfectly balanced with some of the unique architectural features of the original building which have been maintained during the restoration, such as the vaulted ceilings in the living areas. 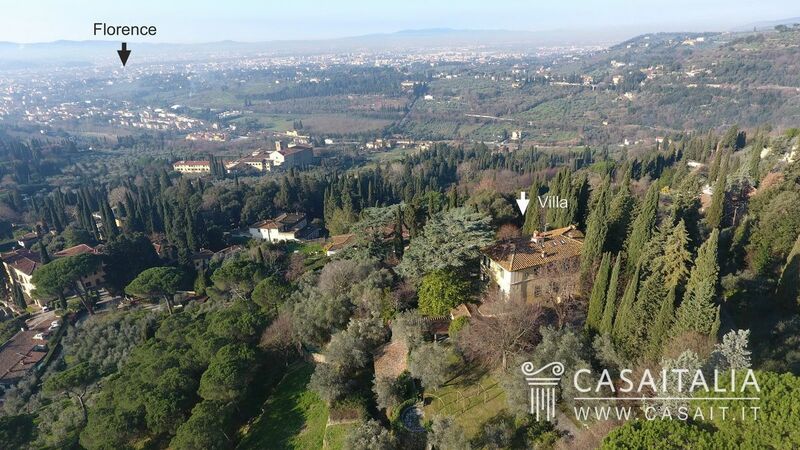 Villa Florentia benefits from two separate entrances: one at the front of the main house and another, on the opposite side of the villa, which takes you to the apartment on the ground floor. 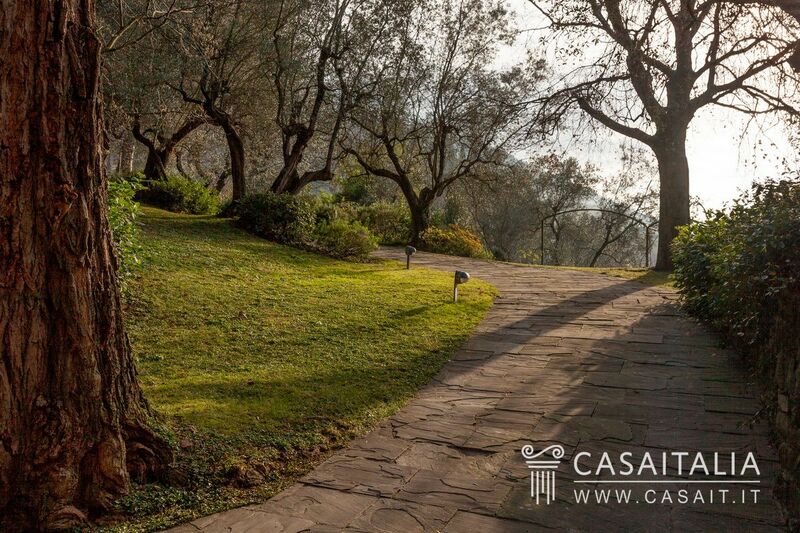 Each one is convenient and functional, with parking space for cars. 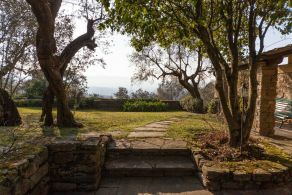 The grounds, measuring around 8,500 sq.m in total, follow the incline of the hill and have been landscaped, creating large, terraced areas with lawns which make the land flat. 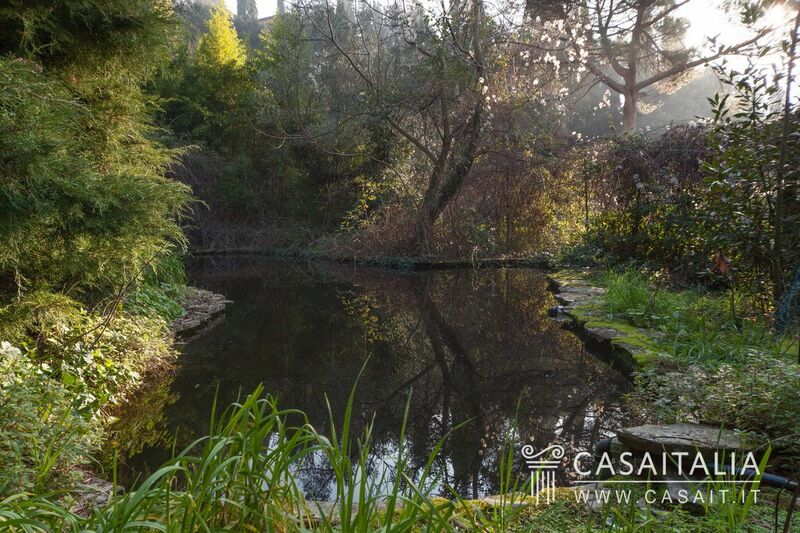 Tall trees, bushes, hedges and a pretty little lake create an intimate, pleasant atmosphere. 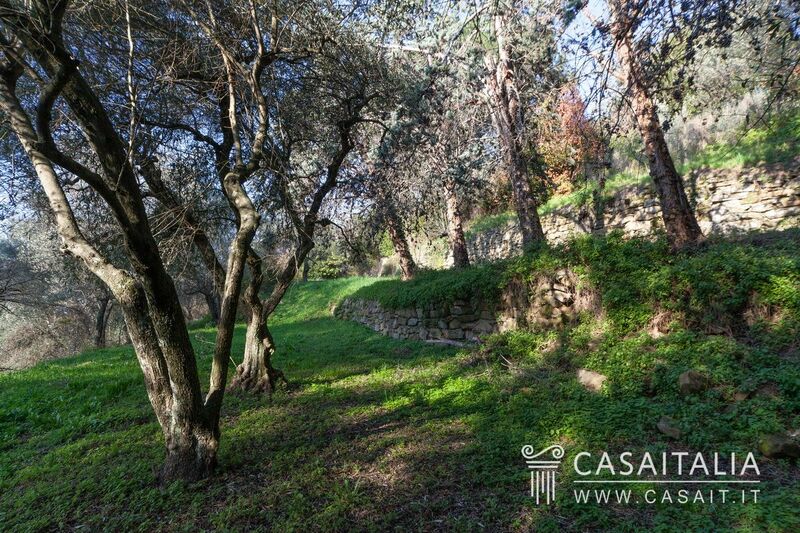 On the property’s land there is also a fertile olive grove with around 100 trees. 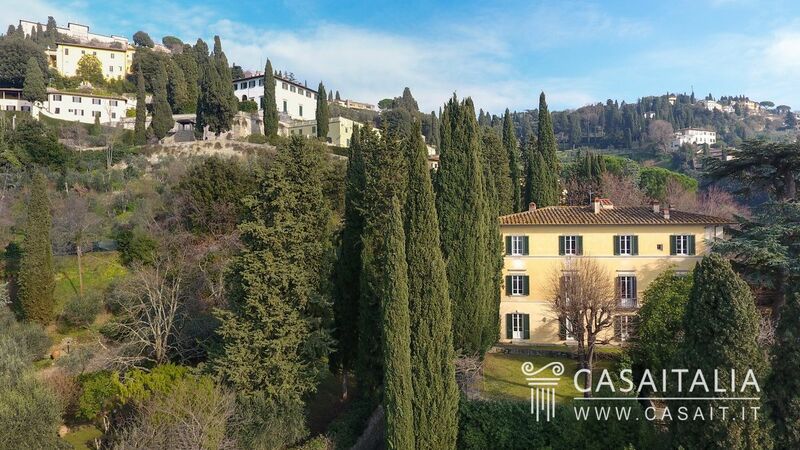 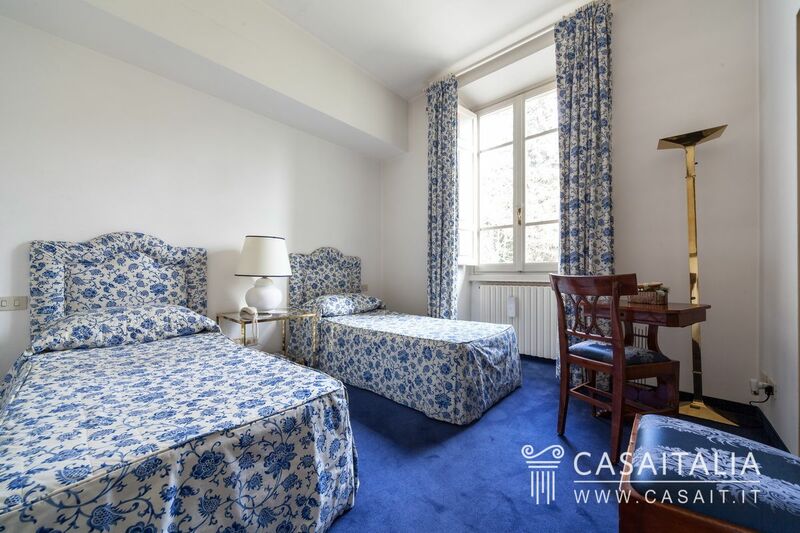 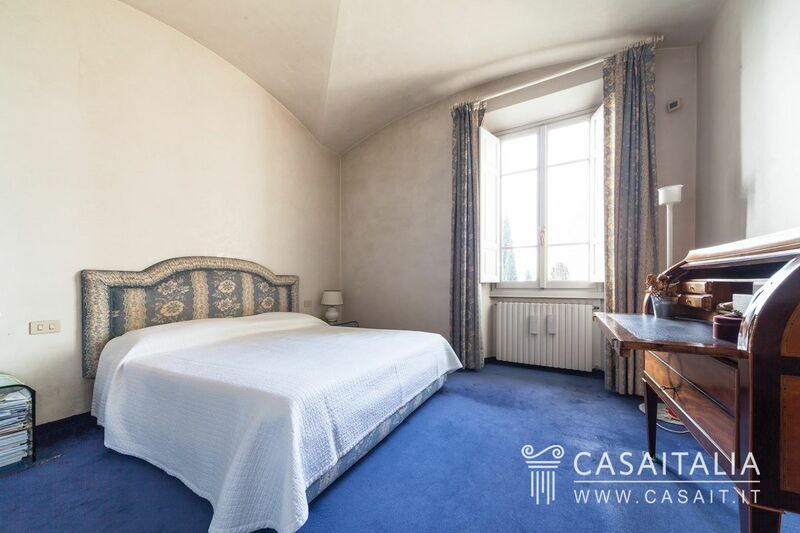 This property, due to its beautiful location a stone’s throw from the centre of Fiesole and a few minutes from the centre of Florence, would be perfect as a main residence, a holiday home or for long stays. 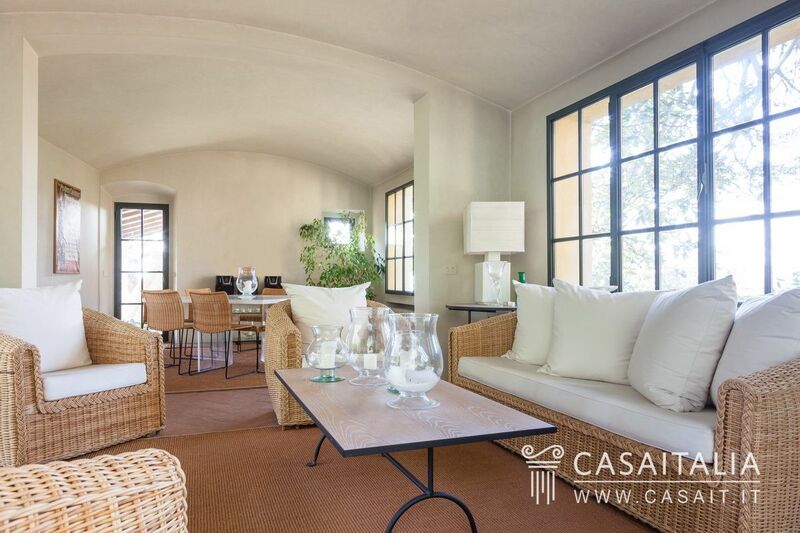 Being divided into two completely separate homes makes it ideal for hosting friends and family while maintaining your own independence and privacy. 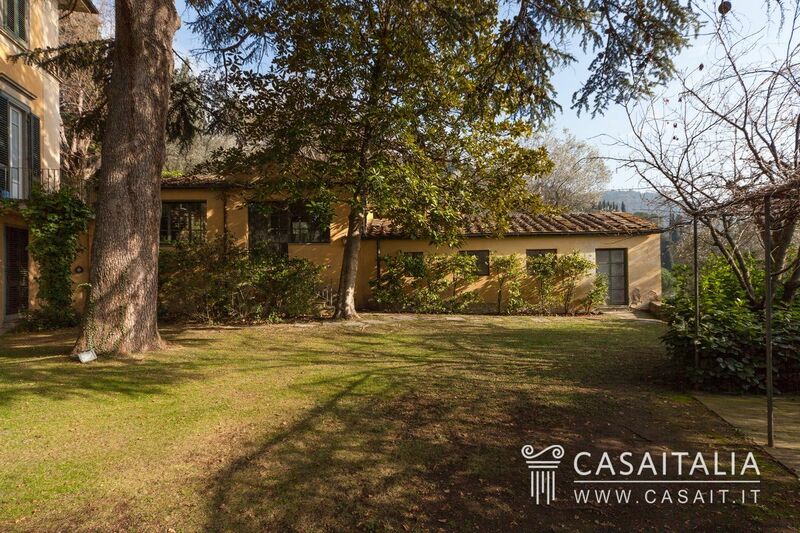 Villa with guesthouse and 5,500 sq.m garden with panoramic view of Lake Maggiore.